Dark fairytales involving children have a long, storied history of striking disturbing and emotional chords, especially when they carry a certain visual impact. 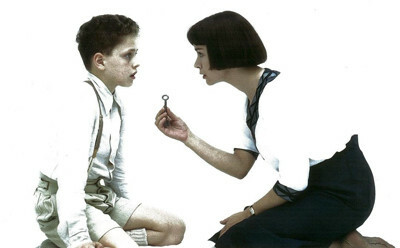 While films such as Labyrinth and The Neverending Story have maintained robust followings over the years, others such as The Spirit of the Beehive continue to develop rejuvenated appreciation following the monumental success of Pan's Labyrinth, Guillermo del Toro's harrowing post Spanish Civil War-era elegy. Regardless of the generation, this indicates that there's something uniquely expressive about surrounding a child with grimness and surrealism that they must escape, sparking an interest to seek out others from the genre that might've gone overlooked throughout the years. Despite entering the Cannes Film Festival, Moon Child (El nino de la luna) could turn into one of such hidden gems unearthed due to an interest in themes: an odd, protracted, but compellingly dreamlike fable that taps into the mentality of cults and interpretations of the divine. Drawing extremely loose inspiration from the novel of the same name by Aleister Crowley, Moon Child tells the story of David (Enrique Saldana), a naïve pre-teen boy who has been adopted by a pseudo-scientific group believing him to be a sort of "chosen one". Between the walls of this group's base of operations, inhuman powers -- such as moving objects with one's mind -- are commonplace, as are chats of prophecy, procreation, and ultimately sacrifice. As David catches wind of some of the more troubling aspects of this group's stratagems, he befriends others among their selected group -- notably a quirky frizzy-haired girl, Georgina (Lisa Gerrard) -- and attempts to escape the area, to pursue whether he's truly among the moon's chosen children or not. A chase ensues across the globe powered by fear over the cult's murderous tendencies, but also a journey of discovery as they try to figure out whether, despite the circumstances of how they learned about them being chosen, they're somehow genuinely special on an other-worldly level. 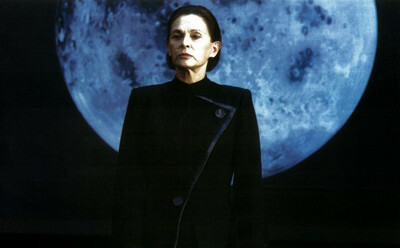 There are two clearly-divided halves to Moon Child: one in which David learns about the innerworkings of the cult, the root of the residents' special powers, and their prophetic ambitions; and the other when he's embarked on his wayward voyage to discover whether he's actually this fabled child of the moon. The mystery aspects at the front end are the more engaging of Agustí Villaronga's construction, in which an exceptional eerie mood beaming with upfront, yet inventive visuals and the score by the band Dead Can Dance draw one deeper into the conspiracy going on inside the cult. Regardless of this, however, the film's shift into the mystical powers of its adopted members ends up being too abrupt alongside the real-world moving parts of everything that comes before it, in which children -- including David -- start moving things with their mind without any real foundation as to why they're capable of doing so. This abruptness comes across as lacking diligence, over something that's critical to the story. As David wanders the halls with his mouth agape at the strangeness before him, Moon Child has this annoying habit of effortlessly feeding him secrets that he shouldn't know, simply because he's constantly in the right place at the right time … and, of course, because the story requires it. Granted, yes, David tends to be the audience's eyes and ears at most points and that affords some leeway with his interactions with the environment, but the entirety of Agustí Villaronga's narrative depends on him being tucked in hollowed-out cubby holes, making eye contact with others by happenstance, and leering in convenient hiding spots just as high-ranking people discuss their plans. He's given marginal ingenuity and strength of character along the way, outside of a questionable tactic used to exploit one's alcoholism to his benefit, which does little little to shape this into a character story about this supposedly preordained "child of the moon", leaving David in a largely undeveloped state throughout. The delicately surreal nature of Moon Child and the ideas surrounding the cult's perception of its gifted sub-members fills the void, where the slight observable rays of magic present in Agustí Villaronga's plotting makes one consider the possibility that the broader mysticism at-work could be real. This swings back-and-forth from being a compelling feature of the story's patterns -- provoking thought about how spiritual collectives get dangerously lost in their beliefs -- and being deliberately evasive and cryptic to such a point that one doesn't have the tools to build a solid interpretation of what's going on. Events that transpire at that previously mentioned changeover point in the story, from the internal enigmas in the cult's lair to the external pursuit for the truth of David's lineage, gravitate toward shock value without enough substance to appreciate what these chosen disciples of the cult are enduring. It's bizarre, compelling so, but that esoteric ambiguity prevents it from being more than a curio leading into its second half. Once Moon Child begins its cat-and-mouse escapades to far-off places involving rocky expanses and tribal atmosphere, the film also departs from the more absorbing facets of its mystery, killing time until the answers about David and his traveling companions eventually arise. Awkward depictions of African culture blend together with facile existential motifs and peculiar relationship building with tribespeople, and the ways in which everything comes into alignment at the end for the sake of suspense, redemption, and conceptual fruition threaten to obscure the other successes of Agustí Villaronga's prior craftsmanship. It's a dull stretch that lasts far longer than it should, regardless of a handful of organic images faintly reminiscent of something by Malick or Roeg, but nothing about Moon Child's second half dissuades one from wanting to discover more about David's fate and how it factors into the design of the cosmos. Gloomy eccentricities end up speaking louder in the end than the anticlimactic revelations themselves, allowing Moon Child's distinctive tone as a dark fantasy to eclipse its vague destination. Cult Epics are working with a new HD transfer for Moon Child that's been derived from the original 35mm film, appropriately framed at 1.66:1 through a 1080p AVC treatment. For an obscure Spanish indie that's getting close to three decades old now, the Blu-ray looks tremendous. Skin tones are warm yet delicate throughout, fluctuating from cooler shades in the early sequences to more sunbaked tones in the African landscape. Cool blues and metallic grays are light yet stable in the earlier shots, and the depths of night darkness and the area surrounding the painting on the moon are strong yet supportive of details, while the contrast balance leans both light and dark at appropriate times to accentuate shadows and the image's dimensionality. Fine textures are present throughout close-ups, in strands of hair and various facial complexions, while the ornateness of the moon's surface and coarse outdoor surfaces -- as well as some celebratory fireworks -- yield beautifully sharp details. Underneath a veil of convincing film grain and with a few marginal specks of print damage here and there, Moon Child looks great from Cult Epics. The Dolby Digital 2.0 Mono track is less impressive, without question, wearing its age very plainly on its sleeve in regard to atmosphere, verbal clarity, and the all-important music in the film. Everything possesses a higher-pitched, overly crisp texture, which makes dialogue sound flatter than it should. Higher-end sound effects fare well with this track, from the rustling of grass under feet and the rushing of wind on a countryside to the ticking of a pocketwatch, and they move quite well across the front channels for its limited atmosphere. Anything on the lower end of the spectrum, from an explosion to any kind of thud, lacks resonance. The music from Dead Can Dance exhibits similar limitations, with reputable higher-end clarity yet lacking midrange strength. A subtle hiss can be heard throughout the track as well, and there are a few very quick instances where the audio drops out for a split second. Again, for a film its age, this isn't a bad that at all, yet it could still benefit from some additional fine-tuning. The English subtitles are tremendous, grammatically strong with unobtrusive font. A bloated version of the stereo treatment arrives in a Dolby Digital 5.1 track. Beyond the Isolated Score with Dead Can Dance -- which ends up being a little less than an hour of solitary tracks without the film playing in the background -- as well as a Lobby Card Gallery and a pair of Trailers for Agustí Villaronga's films, Cult Epics Have also included an Interview With Agustí Villaronga (14:59, 16x9 HD) recorded in Febuary of 2018. He discusses how he got tangled up with Dead Can Dance, what Guillermo Del Toro thinks of his work, and the abstract nature of his film. It's a well-structured, fairly concise, and genuine interview stretch. Moon Child remains enigmatic throughout the course of its fantastical runtime, but the level of enjoyment to be found in its mysteries fluctuates from start to finish. Agustí Villaronga's direction produces an obscure but oddly compelling narrative in its beginning, hinged on young boy's adoption into a cult and how he (among others) factors into the powers of the moon. With an eerie visual language and secrets to be uncovered around every bend of the cult's facility, the first half of the film sparks imagination and crafts a specific mood, impacted by the dangers posed to the young boy David. Unfortunately, the film ventures beyond the walls of the facility, away from the murderous cultists and toward answers to David's lineage, which runs into a sluggishly static patch until a few answers are dispensed … and they aren't terribly engaging. The mood remains, though, and the tones and thematic ideas hold up until the credits roll, making for a unique and atmospheric viewing experience regardless of the destination. Cult Epics' Blu-ray looks great and sounds … okay, and comes with a nice interview with the director. Worth a Rental.